Louis Leakey and Jane Goodall in 1970. From The Leakey Foundation archive. 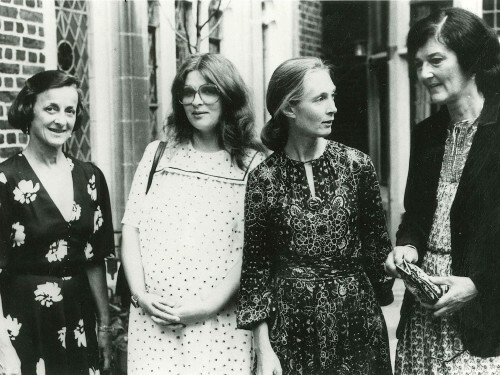 Founding member Joan Travis (left) with “Leakey’s Angels” Brute Galdikas, Jane Goodall, and Dian Fossey. Dr. Louis S. B. Leakey was one of the 20th century’s great anthropologists and a tireless promoter of science education and public outreach. During Dr. Leakey’s travels to the United States in the 1960′s to lecture and raise money for his research, he met a group of enthusiastic individuals who were intellectually curious about human origins. Inspired by Dr. Leakey and his ideas, they started a collective to promote a multidisciplinary approach to exploring human origins research. In 1968, they formed The Leakey Foundation to support Louis and Mary Leakey’s fieldwork and the groundbreaking research of young scientists such as Jane Goodall, Don Johanson, Dian Fossey, and Birute Galdikas. In its first decade of existence, The Leakey Foundation provided funding many of the seminal studies that inform our understanding of human prehistory. Today The Leakey Foundation continues to support the significant studies of researchers such as Zeresenay Alemseged, Jill Pruetz, Dan Lieberman, Frederick Grine, Sileshi Semaw, and many more. Many of today’s prominent human origins researchers got their start with a grant from The Leakey Foundation. Primatologist and Leakey Prize recipient, Toshisada Nishida. Education and public outreach played a large part in the formation of The Leakey Foundation. What began as a way to support Louis and Mary Leakey’s research has expanded over the years to include numerous programs. For over four decades, the Annual Speaker Series on Human Origins has provided opportunities to learn first-hand about cutting edge research from leading scientists in the field. In recent years, The Leakey Foundation has broadened its reach by developing new programs such as the Origin Stories Podcast, our YouTube channel, and a large online and social media presence.